An intense treatment with a natural-looking tint ideal for daytime coverage of breakouts. 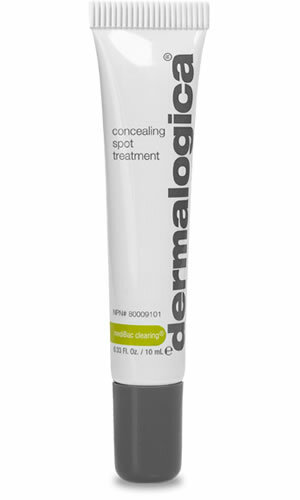 Sulfur and Zinc Oxide quickly target, conceal and help clear breakouts. An amazing alternative for those who prefer treatment products free of Benzoyl Peroxide. Contains no artificial fragrance or color. Shake well before each use. For continuous control of breakouts, pat gently onto afflicted area as needed throughout the day. Use over Oil Control Lotion or prescribed Dermalogica Moisturizer. Allow to dry. Use until breakout has cleared. Sulfur and Zinc Oxide quickly target, conceal, and help clear breakouts. Natural tint conceals breakouts while they're being treated. An amazing alternative for those preferring treatments free of Benzoyl Peroxide. Sulfur and Zinc Oxide: help clear skin by eliminating bacteria associated with acne while clearing excess oil and congestion in the follicle. Niacinamide, Zinc Gluconate, Yeast Extract, Cinnamomum Zeylanicum (Cinnamon) Bark, Caffeine and Biotin: a unique blend that helps purify and inhibit overactive sebaceous gland activity while soothing irritation.